Corals, members of the invertebrate cnidaris group—which also includes sea anemone, jellyfish, and hydras—are sessile, that is they are not mobile but stay fixed in place. Living in colonies, with each individual called a polyp, they secrete calcium carbonate at the base of the polyp, which serves as the skeletal foundation of the colony. Calcium carbonate is continually deposited by a living colony, adding to the size of the structure. Corals reside on the surface of the structure, completely covering it, with the size and shape of reefs differing depending upon the species of coral and the color from algae. Corals feed by extending their tentacles and capturing prey such as small fish and plankton. In addition, coral maintain a symbiotic relationship with algae (zooxanthellae) that reside inside coral polyps where the algae carry out photosynthesis. The algae provide the coral with energy and nutrients in exchange for protection and the light required for photosynthesis to occur. Coral reefs are located in shallow, clear water where light can reach the polyps, and in tropical or subtropical climates. Although reefs were in existence hundreds of millions of years ago during the Cambrian and Devonian periods (among others), they have been subject to numerous devastating extinction events. Most reefs existing today were established less than 10,000 years ago after glacial melting caused a rise in sea level and widespread flooding of continental shelves. 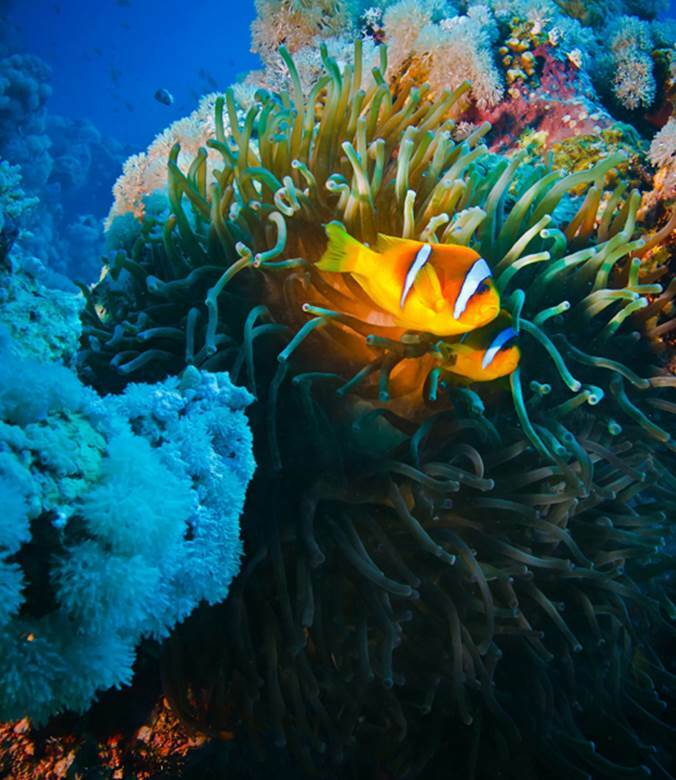 A number of ecological challenges threaten the survival of coral reefs. Natural stresses, such as hurricanes, are generally of short-term duration. Far more serious are a variety of human-induced stresses, such as agricultural runoffs of herbicides, pesticides, and fertilizers; industrial runoffs; pollution from human sewage and toxic discharges; destructive fishing practices; and coral mining. By 2030, 90 percent of reefs are estimated to be at risk for extinction unless aggressive steps are taken to reverse human-induced climate changes and rises in sea temperature leading to coral bleaching, acidification, and pollution of the oceans. SEE ALSO: Algae (c. 2.5 Billion BCE), Fungi (c. 1.4 Billion BCE), Fish (c. 530 Billion BCE), Devonian Period (c. 417 Million BCE), Amazon Rainforest (c. 55 Million BCE), Photosynthesis (1845), Ecological Interactions (1859), Global Warming (1896), De-Extinction (2013). A pair of clownfish nest among the protective tentacles of a sea anemone in a coral garden. The residing algae give the corals their beautiful colors.